Sitting by the picturesque East Lake of Wuhan, this 70-hectare botanical garden was established in 1956 for the study of plant resources in central China and water plants in inland China. 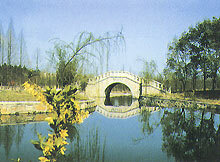 The garden is divided into a dozen or so special gardens for the cultivation of 4,000 or so kinds of plants. It is the largest center in central China for the preservation of plants.